Two young chefs from New College Telford have made it through to the final of a national cookery competition. 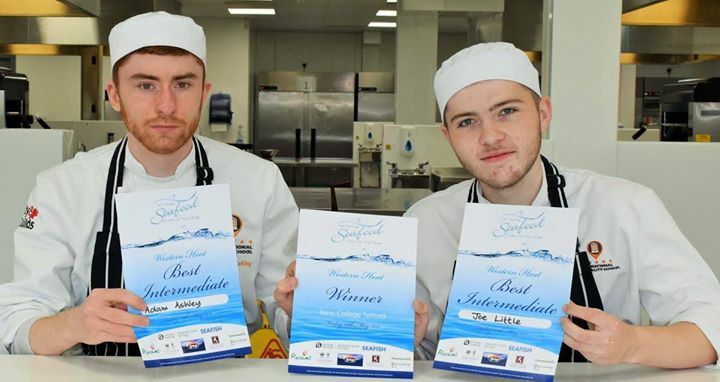 Adam Ashley and Joseph Little will be flying the flag for the college at the UK Young Seafood Chef of the Year finals, to be held in Grimsby on June 12 and 13. Adam, 20, from Whitchurch, and 17-year- old Joseph, from Wellington, made it through to the final after wowing judges in the western regional heats. Their menu included a starter of seared salmon, spiced lentils, and shallot bhaji,followed by an intermediate course of baked cod loin, salt baked beetroot ratatouille with rosemary and parmesan. For main course, they cooked pan-fried plaice with roast celeriac, apple and lemongrass puree, hazelnut foam and a light veal jus. It is the second year in succession that Adam, who is in the third year of a professional chef diploma at New College Telford, has made it through to the national final. And for Joe, who is on a level two patisserie and level three professional chef diploma, it is his second national final of the year – he also won the regional heats of the 2017 Rotary Young Chef competition. Sean McNulty, chef lecturer at New College Telford, said: “We’re delighted that Adam and Joe’s hard work has been rewarded once again. The prize for the winning team at the Grimsby event is £500 per person, plus a top-of-the- range food processor, and £1,000 for their college to spend on catering equipment.